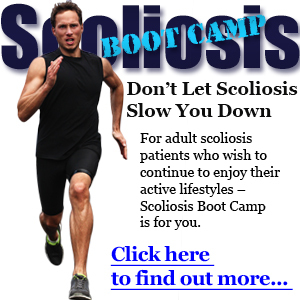 Specifically designed for adult scoliosis patients with curves greater than 25% who wish to continue to enjoy their active lifestyles – Scoliosis Boot Camp is for you. Scoliosis Boot Camp encompasses a rigorous course of intensive rehabilitative exercises to decrease existing scoliosis curves, reduce and manage the pain of scoliosis as well as increase overall mobility. Designed to fit each patient’s schedule Scoliosis Boot Camp is intended to maximize treatments using training exercises and in home workouts.